When P was two she got a super special package with two beautiful dress up dresses inside. One pink and one purple. She loved them both so much that when she put one on she would instantly take it off and put the other on. They were both big on her chubby little toddler body; the skirts a good 3 inches too long. She would wear one or the other all the time. New dress up dresses would make their way into her closet but these two were her most beloved ones. She is now six. The last time she wore the purple one it was last September to a princess dress up party. The skirt hit her mid-calf and I could barely secure the Velcro closure in back. I was sure her arms would bust out as she danced and twirled her way around the party. She looked lovely and I was reminded just how much my girl has grown. Often times we go through her closet to sort out clothes she has out grown. These two dresses have remained in her closet with no success at parting with them at my urging. "They still fit, mom!" she insists! I don't push it but she did surprise me a little after Easter when she was ready to part with the purple one. "Really?" I asked. "Yes, it's time to move it along but NOT the pink one." I moved it to the garage where I had yet to part with it myself. Parting with it not only reminds me that she is growing up physically but moving on from the "princess stage" and I not ready. I. Am. Not. Ready. I looked at this dress, lifeless, in the garage. It is frayed and ripped at some seams, has evidence of fallen ice cream and chocolate treats. Memories. I can't part with this treasure. Who would want this? It's not even fit to donate. The more I looked at this dress. The more I saw it become something else. Something that could move with P into the next stage of little girlhood. I saw it as a messenger bag. These beloved dresses that fray and tear and share the moments of little girls lives are trimmed with lace, embroidery, velvet, ruffles, and lots of fancy satin fabric. I took the purple dress apart and salvaged the trimmings and the gorgeous purple satin skirt. 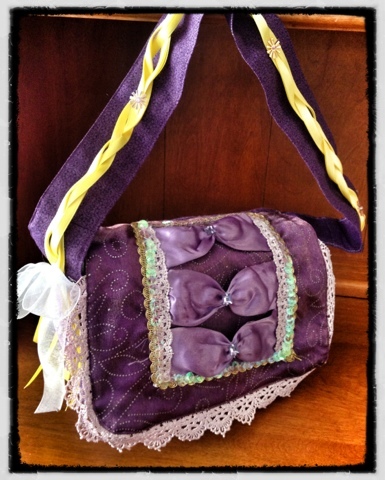 I cut and sewed and presented P with a new bag. She loves it! I have not asked her about moving the pink dress along. I am not ready. I think it might just stay in there forever.